Holds up to 48 firearms. Firearms are expensive. 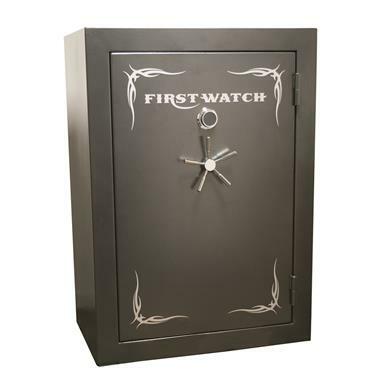 Keep 'em safe from kids and unwanted guests with this First Watch® Blue Ridge Mechanical 48-gun Safe. Heavy-duty Gun Safe is constructed from reinforced steel and features a 4-way locking system with 7-live action bolts and 4 stationary bolts. Plus, it's fire-resistant with a rating of 1,400°F. for up to 45 minutes. For maximum storage and organization, the First Watch® Blue Ridge Mechanical 48-gun Safe comes equipped with height-adjustable shelves and an 18-pouch organizer for chokes, mags and other hunting accessories. Holds up to 48 firearms. Includes plastic barrel rest kit. Note: This item is shipped by commercial carrier curbside. Unloading is the customer's responsibility, including off the back of the truck. This product ships in one box, measuring 64.59"l. x 43.4"w. x 30.4"h. and weighing approx. 906 lbs. No expedited delivery. High-value orders require a physical street address, otherwise insurance costs will be added to the shipping total. Exterior Dimensions: 42"l. x 27"w. x 59"h.
Interior Dimensions: 39"l. x 23.5"w. x 56"h.